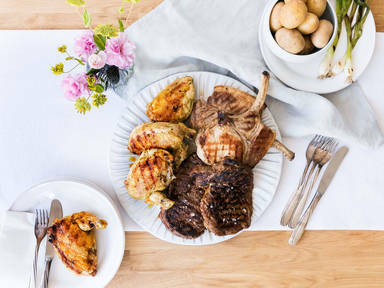 Put steaks, chicken breasts, and pork chops in separate bowls. Season well with salt. To make the BBQ dry rub, add cumin, coriander, black peppercorns, sugar, molasses, smoked paprika, cayenne pepper, and chili powder to a food processor and pulverize. Rub the steaks with the mixture, making sure to massage the rub into the meat thoroughly. Cover the bowl with plastic wrap and transfer to the fridge for up to 2 hrs. or overnight. Remove steak from fridge approx. 30 min. before grilling and remove and discard any excess dry rub. For the Italian lemon-herb marinade, add lemon zest and juice, one-fifth of the garlic cloves, oregano, thyme, basil, one-quarter of the bay leaves, chili flakes, olive oil, and red wine vinegar to a food processor. Blend thoroughly to combine. Add to the bowl with the chicken breasts, toss to combine, and cover with plastic wrap. Transfer to the fridge for at least 2 hrs. or overnight. Remove chicken from fridge approx. 30 min. before grilling. For the adobo marinade, add remaining garlic cloves, peeled ginger, remaining bay leaves, chili peppers, coconut milk, soy sauce, rice vinegar, and grapeseed oil to a blender and blend thoroughly to combine. Add to the bowl with the pork chops, toss to combine, and cover with plastic wrap. Transfer to the fridge for at least 2 hrs. or overnight. Remove pork chops from fridge approx. 30 min. before grilling. Cook meats to desired level of doneness using a grill, grill pan, or oven. Serve and enjoy!